This innovative Initialiste Advanced Scalp and Hair Concentrate from Kerastase is a specialised leave-in treatment that will have your hair looking and feeling thicker and shinier. 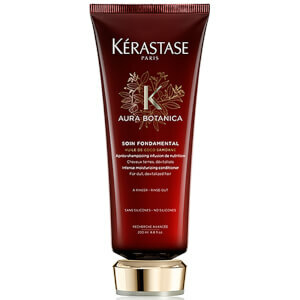 Boasting plant-based biotechnology, Kerastase's revolutionary formulation is enriched with Malus Domestica plant cells which work to give your hair a luxurious, unbeatable shine in addition to a fuller, thicker look. Nourishing and conditioning, this Scalp and Hair Concentrate strengthens and thickens hair fibres to leave your locks more resistant to breakage. My scalp was quite sensitive and itchy. A few drops of this makes my scalp feel lovely and lifts up my roots nicely. Love this product. A great buy! It's realy work's. The hair look so much better. First it has a pleasant smell，second it is abosord fast.It is useful to your hair. This product is one of my favourites. I tend to have psoriasis on my scalp causing it to itch and I also have quite thin hair. This product, which I use immediately after I have washed my hair and whilst it is still damp, really calms my scalp and leaves my hair feeling really good. It's easy to style but doesn't feel as though there is 'product' on it. I have two bottles in reserve so will never be without it. Great product! Got a nice smell and most importantly doesn't leave your hair feeling greasy. I haven't been using it for a long time but I can surely say that my hair feels stronger! This product is great, since using this product it has done wonders to my hair. sorry for my bad english... but simple to say: it works! many new and thicker hair after a while using it. it is my third bottle now. Lovely for your scalp use sparingly but leaves scalp nice.